Cute MTR fleece bunting suit with attractive designs, polyester Slimtech insulation and hood. Keep 'em warm and looking good at the same time! Soft fabric and radial sleeves will make it easy for them to move arms and legs. 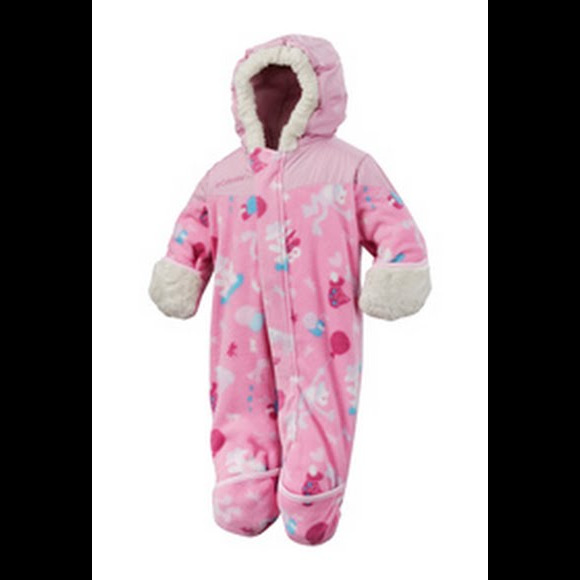 Cute MTR fleece bunting suit with attractive designs, polyester Slimtech insulation and hood. Keep &apos;em warm and looking good at the same time! Soft fabric and radial sleeves will make it easy for them to move arms and legs. Lightweight, thin polyester fiber insulation. Fibers interlock and trap small pockets of air for efficient body heat retention. Additional underarm space allows for easier arm movement. &apos;Maximum Thermal Retention&apos; fleece is a strong performer for Columbia season after season. A quick drying, non pilling polyester stretch fleece.